Following a "mind-blowing" TV trailer earlier this month and rumors of a potential crossover with X-Men, 20th Century Fox has released a new TV spot for Fantastic Four, arriving in theaters nationwide August 7, 2015. The video gives us a new look at the four main heroes, Mr. 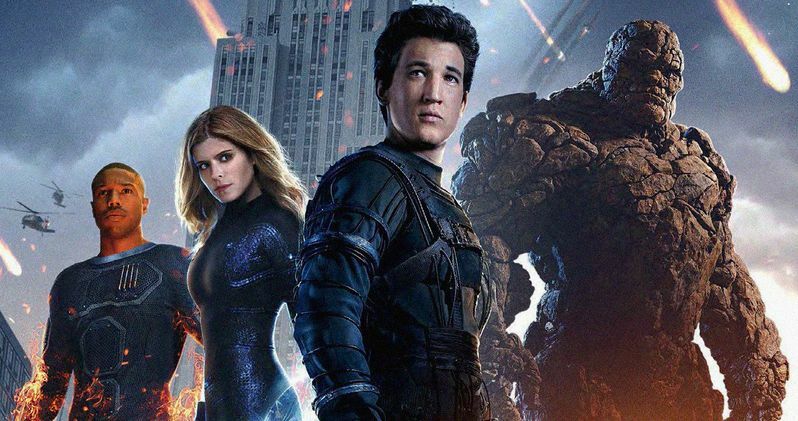 Fantastic (Miles Teller), The Human Torch (Michael B. Jordan) The Invisible Woman (Kate Mara) and The Thing (Jamie Bell), who represent a "new generation of heroes." We also get a brief glimpse at Toby Kebbell's Doom, who we hopefully will get to see more of as we get closer to the late summer release. Fantastic Four is a contemporary re-imagining of Marvel's original and longest-running superhero team, centering on four young outsiders who teleport to an alternate and dangerous universe, which alters their physical form in shocking ways. Their lives irrevocably upended, the team must learn to harness their daunting new abilities and work together to save Earth from a former friend turned enemy. The supporting cast is rounded out by Tim Blake Nelson as Harvey Elder and Reg E. Cathey as Dr. Franklin Storm, the father of both Sue and Johnny Storm. 20th Century Fox has already staked out a June 9, 2017 release date for a sequel, The Fantastic Four 2, although the follow-up's status will most surely depend on how this reboot fares at the box office. Does Fantastic Four have what it takes to become this summer's final big-budget blockbuster? Check out the TV spot and let us know what you think below.